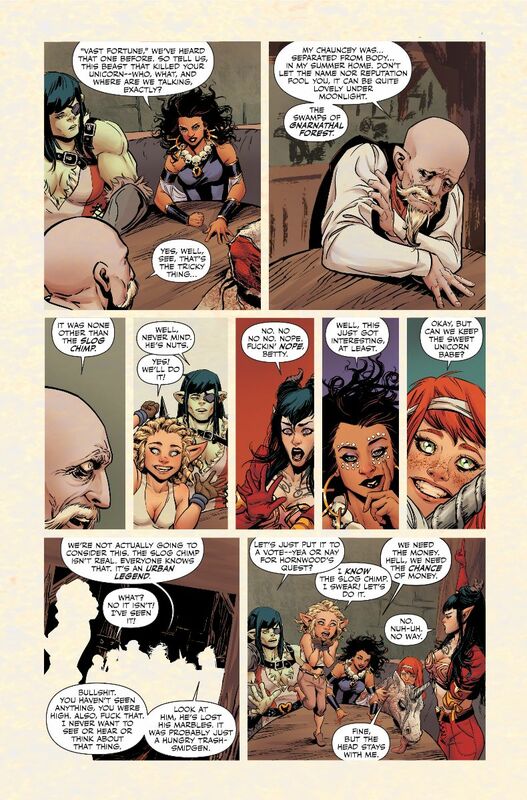 Before Ferrier, Petraites and Lesko take the reins of the main Rat Queens book in June to launch their epic new storyline, this new standalone adventure will give us our first taste of this creative team’s take on the Queens. 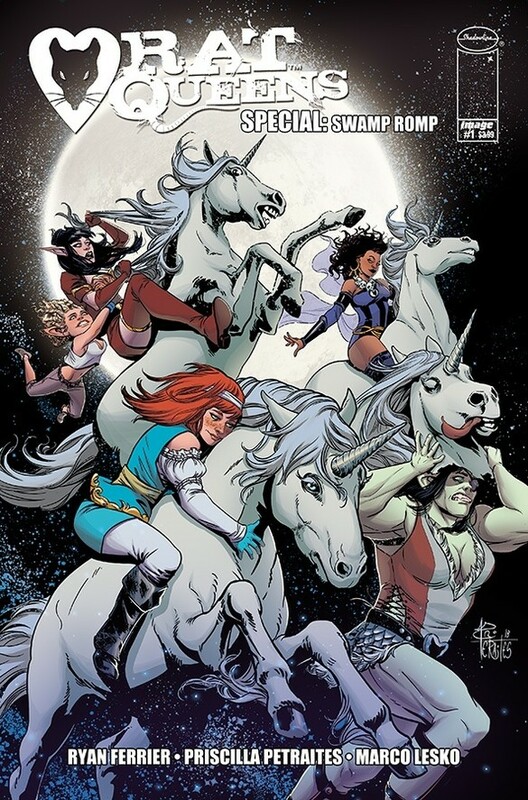 Set in an undisclosed time, the Queens are doing what they do best – being penniless and drinking excessively – when an old man with a dead Unicorn calls them to action. With the promise of his vast fortune, the old man asks them to kill a creature of myth known only as “Slog Chimp.” Of course, things are never as they seem, and the Queens are about to find themselves in the midst of something much stranger than it first appeared. It’s a fun, simple concept. It’s relatively low-stakes and has no bearing on any other storylines that have or will happen in the main book, but it builds itself off the iconic humour and action of the series to make a satisfying and complete 32-page story. The pacing is great from the first page onwards, and things are constantly moving with zero wasted space and a bevy of jokes and scenarios that always hit the mark. All of the individual Queens get time to shine, dealing with the existence of Unicorns and the Slog Chimp in different, hilarious ways. It’s twists and turns aren’t always unpredictable, but the writing and characterization provides new and exciting angles for the reader to enjoy how it plays out. 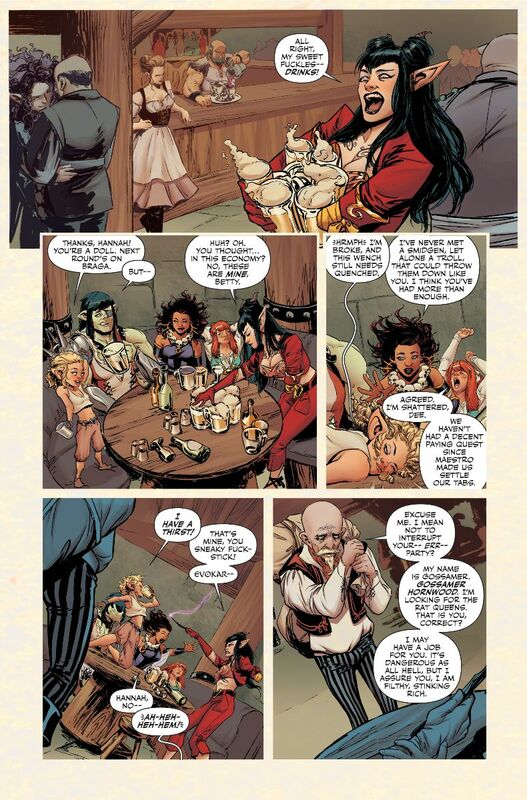 At the end of the day, it’s pretty much a pure distillation of what makes this series fun, while also feeling like a Dungeons and Dragons one-shot in Rat Queens form. Petraites and Lesko make an incredible mark on the series with this issue too. Their artwork is pure beautiful fantasy; expressive, bold, highly detailed and kinetic. Characters are emotive and alive, and whenever the action ramps, Petraites makes every scene an explosive, gory feast for the eyes. The layouts and art direction also shine through this issue, making every page a unique and incredibly fluid experience. 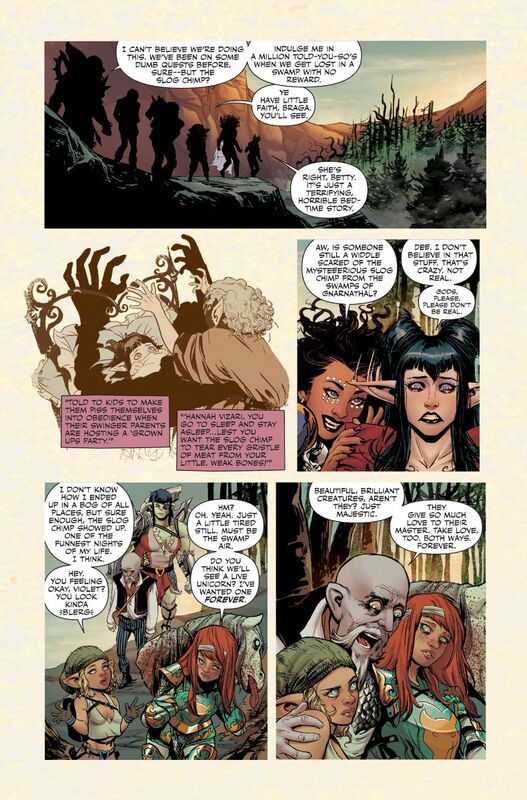 It already feels like an iconic style, and Lesko’s colours add so much to both her art and the world itself. The atmosphere and shadow Lesko brings with the darkened colouring for the spooky swamp and dank tavern, and the emboldened, vivid colouring for the spells and magic make these scenes really pop off the page. 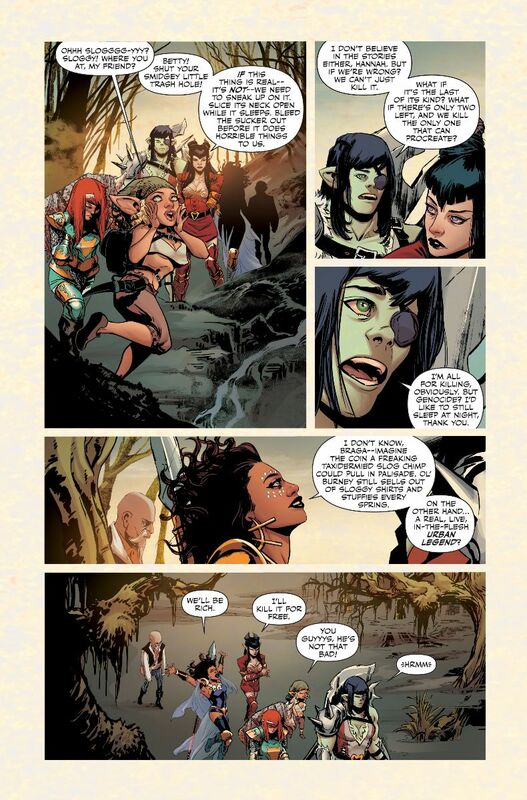 Rat Queens Special: Swamp Romp is both a great sales pitch for the new creators who are poised take over the main series, and a great example of why a good one-shot is one of the most satisfying reads you can get. And while Swamp Romp is perhaps inessential in the grand scheme of things, it’s a pure delight from start to finish. 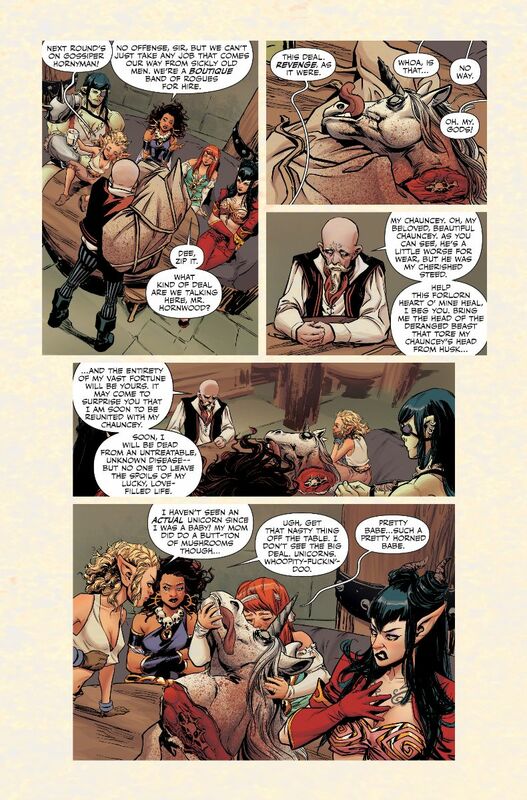 Packed with the everything we love about the Rat Queens, with spot-on characterization and a shining art team, this special delivers a simple, enjoyable tale every RQ fan is sure to love.